One of the ironclad rules of this blog’s coverage of The Saga of Team Kimberlin is that the family members of the individuals in Team Kimberlin who do not interject themselves into TK’s activities are off limits and their privacy is respected to the greatest extent possible. OTOH, Team Kimberlin views the members of my family as fair game. This post about Another Down Twinkle Stooge from five years ago shows an example of TK drivel. 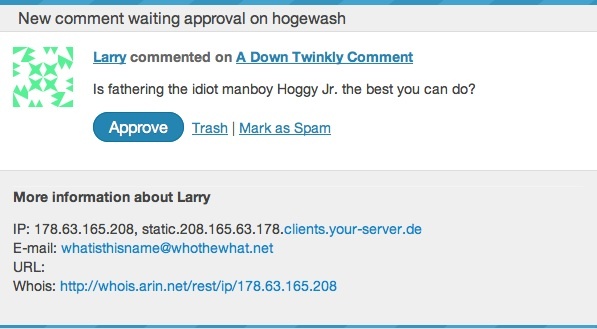 “Larry” has an IP address from a German ISP noted for hosting spammers. I wonder where Moe and Curly will check in from? And, “Larry,” I’m quite proud of my son. He’s not an idiot, not in either the medical/psychological or the colloquial sense. The medical definition of idiocy is a very low IQ that ranks in the bottom 1%. Will’s IQ is actually in the upper range of the upper 1%. Like many young men, he doesn’t have all the experience that brings wisdom with age, but he’s no fool either. So, yes, he’s my best shot. Will and I had a great time together Tuesday evening at a picnic held after the installation of a plaque honoring Mrs. Hoge and her work with the Carroll County Forestry Board. This entry was posted in Blogging, Team Kimberlin, Trolls and tagged Cabin Boy Bill Schmalfeldt by wjjhoge. Bookmark the permalink. I hope our generous Host will post a picture of the plaque, so we can honor her too. My apologies to our kind Host, I didn’t scroll far down enough to see the plaque picture. My apologies to our Host, I didn’t scroll far down enough to see the plaque picture. In other news, looks like one of our idiots made it to your neck of the woods, and received a pretty solid lesson in what happens if a rural Virginia homeowner tells you to scram – and you ignore the warning. I shudder to think how the lives of the mother and daughter would have been ruined had this happened in the People’s Democratic Republic of California. Consensus is that he’d have killed someone if he’d tried it here.